I spent hours yesterday reading this amazing book. I would like to talk about it, but i'm afraid that my words would be unable to do it any justice. Read this book. Send a copy to your father to read. I have. It is a truly seminal comic, many consider it too disturbing but I don’t think you can cover such a subject with out that result. I would be nice to think that if everyone was made to read Maus, there would be a move to a peaceful and intellectual resolution of problems in the world but pessimist in me suggests the reality would be reaction against it. 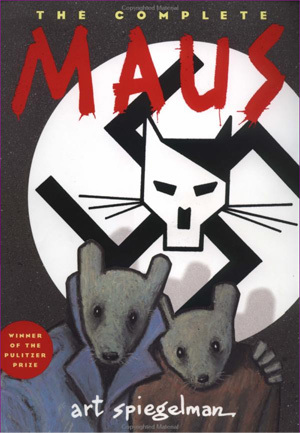 I do think that Maus should be made available to schools, I am not aiming to be contentious but I feel this is such an important subject and Maus conveys the issues so well…..
As a side note my local a comic shop in the UK and due to the shortage of copies imported some UK print run editions back from the US. It is my understanding that UK Customs and Excise seized them for being obscene and destroyed them!